This sad little exercise in elementary school graffiti appeared on the Voice of Arcadia's very strange Facebook page yesterday. Who knows, though the anonymous person who runs that site isn't exactly a titan of courage, it might still be up. He has been known to cut and run some times, and things do mysteriously vanish. Usually when people are attempting to engage in a political discussion, no matter how absurd or pointless, they at least try and make some sense. But VOA doesn't really do that. I'm not sure they even care. They just throw this kind of crap out there and make believe it means something. Then dare you to do something about it. Just like any other playground Mussolini. 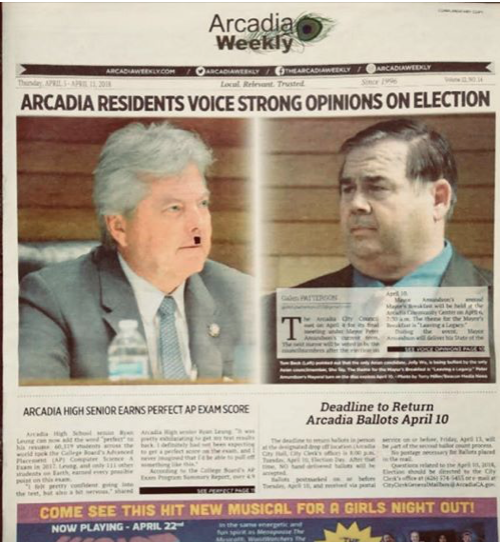 Of course, this plagiarized and defaced Arcadia Weekly cover page did have a rather lengthy screed attached to it. They usually do. Written this time by some fool calling himself "Concerned Citizen." Here is a paragraph from his godawful mess. "He is considered to be intentional violation because he has no reasons to amphasize that he guaranteed all of these fraudulent or criminal activities 100% clean election and he put in a deliberate effort to stop any possible criminal investigations. Intentional violation is punishable under the law." Just complete and utter gibberish. So I'm a little at a loss. What is the point? Who exactly is it that is impressed by the sorts of garbage found on Voice of Arcadia? What is it they believe can be gained? That it will make Sho Tay mayor? Is Mark Hong leaving Arcadia? As I am sure you recall, Mark Hong is the guy whose obsession with Tom Beck was so great that he invented an entire persecution fantasy around the four or five emails they exchanged back during the recent election. It was quite a little soap opera Mark had going on there for a brief while. However, like all mad fantasies built upon nothing more than duck farts, this all came crashing down around Mark's ears. And so devastating was the emotional effect of this loss that he is apparently packing up his belongings and leaving Arcadia for good. Here is that stunning news, as found on Mark's Facebook page. Mark's four or five Facebook friends are apparently upset about this because there have been some teary comments left on his page. Here is a portion of that woe. I certainly hope it wasn't anything we said. find it difficult to be re-elected. A stupidity magnet pulls such people to Sho. Thanks Tattler ! Hopefully Sho Tay will self-destruct before his current term is up. Do not fall for Sho Tay and his supporters' savage tricks and accusations. They are desperately trying to divert attentions away from Sho Tay's lies and illegal or unethical conduct. Does Sho Tay support this? Big money and greedy profits are at the core. Sho is merely their energizer bunny. He describes himself as a problem solver but in reality he is a problem maker. Sho Tay is like a casino greeter. A grinning backslapper. His job is to make sure the clients are comfy and their drinks are fresh. And if it is decided that a particular guest is worth it, he'll set up a meeting with the big guy upstairs. Big babies, all. Who (seriously) would waste so much of their energy on this crap. Some enjoy it, some don't. If you don't like this sort of thing, go elsewhere. I don't think there is anything like this going on anywhere else in the United States. The mansionizing development crowd in Arcadia has ignited a racial conflict here for their own selfish reasons. Unbelievable. Mark Hong described Arcadia as a city that asn't all it was cracked up to be and neither was the school district. This was when he first moved here. Then why move here and subject your family to such a second rate community and school system? Likely he was following the money train? Fun Fact: The combined IQ of Voice Of Arcadia and my dog is the same as my dog. They just do different kind of tricks. Hope they all have their shots up to date. They need to be walked. I am sure there are political wheels still moving in darkened backrooms still plotting a take over of some sort in the near future or planing ways to thort any progress that could have been had? See yeah all on the funny papers. A comedy where nobody laughs. "A mansion on every lot and a cell tower on every block"
I guess the Development Party is not big on respecting election results. What type of person thinks it’s ok to put a Hitler mustache on any picture of anyone? VOA’s post is not appropriate. The gibberish reflects a mindset of someone who knows nothing but thinks they know something and hopes that if they say it others will believe it. Mark Hong and Helen need to be appointed as Commissioner's in Arcadia, that is how it is done in Sierra Madre. In Arcadia they become volunteers for the police department. The lunatics are watching the asylum. I am going to assume Sho Tay is good with this and isn't going to say anything. Sho Tay could have done much to be a positive force to counteract all that is going on. He recruited a Wechat "army" that marches out of control. The joke will be on Arcadia if he becomes mayor. It certainly does call into question Sho's judgement. Is Mr. Tay also connected to the Angry Arcadian Page? Sho Tay is connected to everything just like puppets are attached to the puppet master. Sho might be connected, but he is not the controller. Sho Tay has done little to nothing to reverse what is going on. He smiles and ignores. He is guilty by omission. Silently hiding in the shadows is Chandler. He does not smile but, like Sho Tay, has done nothing to condemn anything that is going on. Why should he? After all he accepts $$$ from the special interests behind all of this. He just gets others to do the dirty work to make it look like he has clean hands. He and Sho are identical voting twins. They vote the same and it is for overly built mansions. There are the kinds of things that go on in a corrupt city. Sho Tay and Michelle Obama have the same thing in common, they go high when others go low, it is not Sho Tay's place to speak out, although if he gave # hashtag references before he spoke, that would make a difference. Leadership requires speaking out, not hiding in shadows created by proxies and trolls. In this way Michelle and Sho are miles apart. 10:49am. How so? The same both sold out to the highest $$$, both also hashtag bolgs, that makes a difference, both speak out on what they "feel" is wrong. Choose any day of any month, Tattler blogger sensitivity training. Chen, Liu and Hong get schooled here a few times every week. Dear 10:44 & 11:38 --Sociopaths do not distinguish between right and wrong or care about harm to their community. They just want immediate gratification and will try endless manipulations or lies to get their way. We are seeing a wave of arrogrant narcissists who have no respect for others . Thanks 3:38. Scary article. Somewhat different then we have going here. Underlying message the same. Greed, greed, and then more greed. Property nobody lives in because the properties are nothing more than money dumps. Losers are the people who live there. No matter. They are mere objects to push aside with bulldozers and to be crushed beneath pallets of cash. We have a president who says exercise presents more risk than benefit and meets with Kim Kardashian. You Dump minions still happy you put him in office ? Oh wait, I know, the Dow is up and that’s all you care about, your silly 401k. Please contact Beck, Amundsen and April with your request for them to not vote for Tay as mayor. It’s time to stop this nightmare. What does this say about our Planning Commission (unpaid positions) ? My one story home neighbors appealed to both the Planning Commission & City Council and lost, a three story building planned adjacent their back yards & lousy zoning law approved. I have sat in CC & watched other one story dwellers lose to huge next-door homes....their petitions futile & financial loss & humiliation/anger evident. The story is: don't waste your time, residents have very little rights in Arcadia. Few residents can afford to sue as individuals. The bigger intrusive residences will pay more taxes. Sho Tay should not have been rotated in CC as the new Mayor( 40 days ago) before resident's feedback was heard. Once Sho Tay said, while running as a new candidate , "I have big house, your little house next-door make my big house look bad". I bet there’s this kind of crap going on in Arcadia, with certain city council members who are backed by big name developers. One can only get away with it for so long - until you get caught. What does it take to get the feds to take note? What's that I smell? Arcadia! VOA and its members are a disgrace to Arcadia. What an embarrassment! Their mindset is definitely racism. Pathetic. If Sho Tay had a moral compass, he’d advise to shut this down. But no, he loves the term “banana” so anything goes. Can’t wait to see the comical June 5th CC meeting. Wonder how many folks will be speaking from the same script provided to them? Tay's biggest accomplishment in life is being a Pimp to all the uninformed fools in Arcadia. Hey dude, I may be uniformed but I'm no Tay hoe. Just an angry Arcadian.